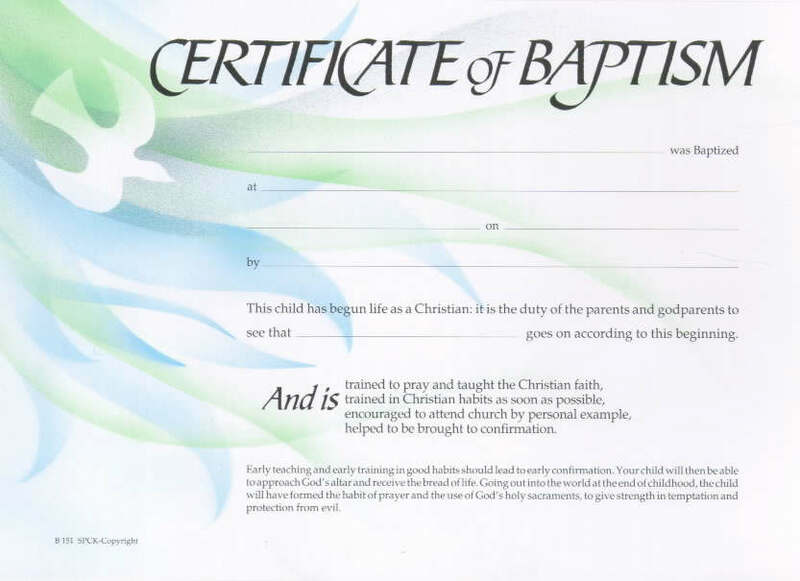 Used by Anglican Churches to present on the occasion of Baptism, these certificates are a valuable Church resource. Used by many Anglican churches. This child has begun life as a Christian: it is the duty of the parents and godparents to see that _________ goes on accordingly to this beginning. Early teaching and early training in good habits should lead to early confirmation. Your child will then be able to approach God's altar and receive the bread of life. Going out into the world at the end of childhood, the child will have formed the habit of prayer and the use of God's holy sacraments, to give strength in temptation and protection from evil. Certificate of Baptism: Pack of 20 was published by The Society for Promoting Chri in January 1986 and is our 163rd best seller. The ISBN for Certificate of Baptism: Pack of 20 is 9780281046102. Slightly changed - for the better! We've been using these at my church for ... years (about 10 at least) and the cards have recently changed slightly so that they no longer have a glossy finish. This is BRILLIANT because you can now use the same pen that you use for the Register rather than a potentially blobby biro. At last. Looks much better and is more user friendly. A good certificate that doesn't need top be signed so is useful when others in team are doing the preparation including filling out the certificate. Got a question? No problem! 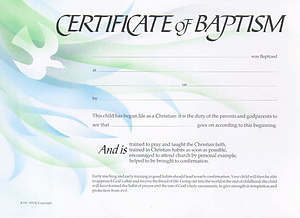 Just click here to ask us about Certificate of Baptism: Pack of 20.